Ali Mohd Kumhar’s family is busy moulding small round earthen pots for livelihood. He and his family are among hundreds of such artisans in the Kashmir Valley who are carrying forward their forefather’s legacy of fashioning earthen pots called kanger. The kanger is used by the Kashmiris as firepots beneath their traditional dresses to keep the chill at bay. It is normally kept inside the phiren, the Kashmiri cloak, or inside a blanket. If a person is wearing a jacket, it may be used as a hand-warmer. After the earthen pots are moulded, these are sold to the artisans who complete the wickerwork around them, erect two arms to handle the pot, and also colour it to give an aesthetically delicate shape. The final product then goes to the market. Today, even when all kinds of facilities, including gas stoves, heaters, and specially made hamams, are available, Kashmiris still prefer the traditional kanger to face the hostile months beginning from October. "What Laila was on Majnun’s bosom, so is the kanger to a Kashmiri’. The Kashmiri proverb sums up the relationship between a Kashmiri and the kanger. The non-locals call it kangri. Those visiting Kashmir for the first time during the winter season are surprised to find people carrying fire in their hands or in their laps but every Kashmiri knows how to handle the apparatus with care. All he has to do is to fill the koundal (earthen pot encased with wicker) with tsini ( charcoal) and embers and take this inexpensive source of warmth everywhere, including offices and business establishments. It is because of its mobility that the kanger has been a constant and popular companion of the Kashmiris during the winter months. Each family member has a Kangri of his own. For guests also a few kangris are kept earmarked. Small children have smaller kangris. Sometimes two members share a kangri. This form of warming up is called Shalfa. H. L. Chatta, general secretary of All-State Kashmiri Pandit Conference (ASKPC), says this age-old warmer from Kashmir has even been introduced to the rest of the country. This happened particularly after the mass migration of Kashmiri Pandits from the Valley in 1990. Kashmir-based Muslim employees who stay in the winter capital of the state during November when most of the Jammu and Kashmir Government’s offices and the Civil Secretariat function from Jammu, have also contributed to its popularity. "Now in Jammu and Delhi, particularly at fruit mandis frequently visited by Kashmiris, even some non-Kashmiris have switched over to this traditional way of keeping warm during the winter," says Chatta. 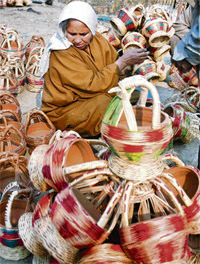 It is generally believed that Kashmiris learnt the use of the kangri from the Italians who were in the retinue of the Mughal emperors, and usually visited the Valley during summer. In Italy and Spain braziers were made in a great variety of shapes and were profusely ornamented. Historical data, however, contradicts the claim that kangri has come to Kashmir from Italy. According to Sir Aurel Stein, Kashmiri chronicler, the name is in all probability is derived from Sanskrit, Kasthangarika Kash (wood) and angarika (embers). Earliest references to kangri are found in Mankha’s Sri Kanthcharitam and Pandit Kalhana’s Rajatarangini. Mankha describes it as hasantika, i.e. a pot that could be carried in hand. He says it was in regular use in his times. Kanger has fascinated European travellers too. Historians like Bernier, Moorcraft, Hugel Vigne and others have all noted the importance kangri holds in the life of an average Kashmiri. Although the whole of Kashmir makes kanger, the Bandipora and Chrar kangris are considered aesthetically the best and durable and can be a good gift item too. Prices range from Rs 50 to Rs 150. Kanger has deep roots in Kashmiri culture and its folklore. Just as a person is first greeted with a glass of water in hot climate areas, in winter every visitor to a Kashmiri family is provided with the warmth of kanger. A host feels proud sharing this display of traditional warmth. 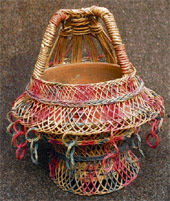 Kangri is mentioned even in Kashmiri folklores and poetry. For example, as one poem says, ‘why should an individual share his kangri with a stranger’? Even today, a newly married bride buys the kanger as a prime gift, especially for the first Shivratri after her marriage. "I have already sounded my parents on purchasing a Bandipora-make kangri for me this Shivratri. I know I don’t require it in Pune but since this is my first Shivratri after my marriage, to have a traditional gift like kangri is an asset. It will add beaty to my drawing room that houses all such Kashmir made items," says Shivani Kaul, a software engineer.